(Question) 20-Sep-1999 Pluto Squaring Nodes Is it possible that Pluto, the planet squaring the nodes in the skipped steps dynamic, could also reflect a soul who, for this particular life, has chosen to "block" to some extent the level of evolution it has attained prior to this life, for deeper reasons. (and not because of de-evolution or misuse of whatever). And within this, at some point in the current life the individual becomes 'unblocked', & "recovers" a vast recollection of awareness within its consciousness, inconceivable to itself prior to the unblocking. If this is the case could you please supply an example which examines this dynamic relevant to the Soul's intention and evolution. Or, if I could have a general understanding in your words. (I have given some thought to possible reasons why such a condition would exist relative to the overall intent of a chart's aspects/dynamics). I understand that from time to time even "Masters" choose conditions not unlike this idea in some life or other, recovering its specific destiny & purpose on Earth which in the first place necessitated reincarnating with these conditions in place. - Ingrid M.
I'm fascinated by that question. Is she referring to a case like Mahasaya where his previous self realization was blocked from him until a key point in his life? Does this mean there is no karma for that soul to work out? how would we read the skipped step in such a case? what are the philosophical implications of that? Also, what kind of observations and correlations would indicate such a case? are there any other signatures besides pluto square nodes that indicate this potential? I've been told by a clairvoyant friend that a relative of mine has fully awakened in the past and has chosen this life to not wake up. as you can only imagine, she has not had an easy life. she's married, mother to 4 children. works as a nursery teacher for past 25 years. suffers from depression her entire life. was abused- health and mental issues. id guess second individuated bc of her awareness of how things are. she still generally follows the guidelines of the consensus- yet she feels differently from it. if what my friend says is indeed so, how could i verify it, or not, using the ea method? i have a such a strong desire to express how much i appreciate this mb. this is a HUGE gift and service. In almost all of the other cases that I know of in which this blocking of their consciousness, their natural natures, has happened from within the Soul itself it has been caused by a lifetime, or lifetimes, in which some major traumatic circumstance has happened BECAUSE OF THEIR INHERENT NATURES AND THE CONSCIOUSNESS THEREIN. And because of the nature of the trauma(s) this has caused the Soul such great fear in terms of being who they inherently are, their natures and consciousness, that they have then 'compensated' for their natures by 'hiding' from the world, the consensus world, who they actually are. And in that act of hiding trying to appear 'normal' from the point of view of the consensus world. When this happens from the point of view of Evolution it is as if they come to a standstill, and are simply marking time. Psychologically speaking, they create the conditions for depression and the sense of simply going through the motions of life itself. Others will typically keep themselves overly busy with doing one thing after the other in order to avoid as best they can the deep inner pit of loneliness, and existential void, and no real sense of meaning or purpose of a lasting nature. Others can degenerate into a life of escapism in a variety of forms including drugs and alcohol. Compensation as a dynamic is astrology correlations is Jupiter, Sagittarius, and the 9th House. Trauma of course is Uranus, the 11th House, and Aquarius. 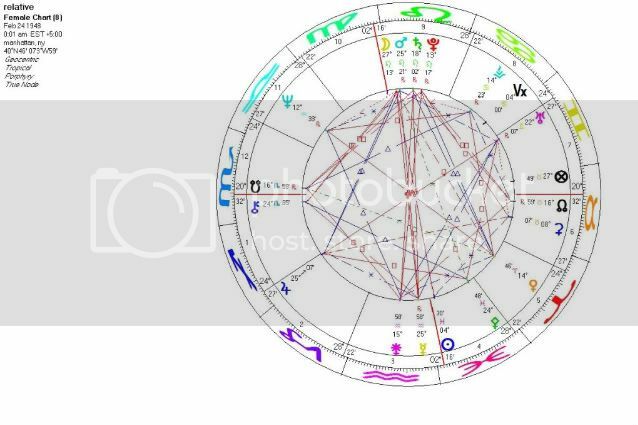 There are many possible astrological signatures that can correlate with this situation but the Sag, 9th House, Jupiter, Uranus, 11th House, Aquarius archetypes will be implicated in all cases. All Souls have karma unless a Soul is in the most advanced states of Evolution such as an Avatar. Skipped steps are read when any planet is square the nodal axis the the Evolutionary intent of course is the recover the skipped step(s). In terms of your friend there is no way of being able to look at any birth chart and know if a person is 'fully awake' or not. One must do the traditional astrology thing which is to make observations of the person. But your friends case is the archetypal embodiment of the skipped steps that have been caused by compensating for who they actually are due to past life traumas that have caused her to hide. The hiding part in her chart is symbolized by her S.Node in the 12th house, and also her Venus in opposition to her Neptune. Feel free to ask more about this is you wish Ari. what would be the resolution for "marking time" with respect to this chart? and even generally speaking. The resolution in this chart, and all charts in which compensation has taken place like this, is to first desire to undo the compensation which means to acknowledge that it taken place in the first place. Once that occurs then the next step is to determine the causes, reasons, why that has happened. Once the reasons and causes have been determined to then determine the natural ways to undo that compensation in such a way as to utterly redesign the life in order to reflect who the Soul actually is. This of course requires great, great courage. The specific causes of what led to the compensation is different in every case as are the ways to undo it in order to redesign the life. Each birth chart in which this is symbolized tells the unique story for each. Feel free to ask more about this if you wish. Hi there Rad, and thanks for your thoughtful response. Not only is it difficult to come to terms with compensating behavior, but in order to move forward, a person also needs to embrace who they actually are. how can you determine something like this? can anything be seen in the birthchart? I have seen something about Sagittarius illuminating the way, but I have to wonder if it isn't more than this (just my personal opinion). The entire birth chart reflects and symbolizes the unique individuality of all Souls, not just one symbol, but the entire chart. The beauty of EA, when rightly understood, offers just that. EA requires that one interface with the individual, to talk with them, observe them. The interface then between such interaction with the person and their birth chart generates the understanding of the uniqueness, the natural individuality, of their Soul. Thank you for your responses Rad. I have 2 questions. 1. a planet squaring the node implies karma. however, how would we read that for a soul that we observe to be an avatar? does it always imply karma? im not clear if your even saying that it's possible for an avatar to have a planet squaring a node. In the example of my relative, what kind of observations could possibly lead to such a conclusion? 2. are semi squares to the nodes also considered skipped steps in ea? Could you differentiate the basic karmic difference between square and semi square to the nodes? First, we need to discriminate between the word 'karma' and the natural evolutionary process, intention and necessity, that all Souls go through. In context of an Avatar there is no karma no matter what symbols you see in their charts. There is evolutionary intentions and necessities which of course is proved by the nature of their lives. Second, semi-squares to the nodes do not correlate with 'skipped steps'. And the reason is that the nature of the archetypes , the evolutionary process therein, are different than squares. If you have a copy of Wolf's second volume of Pluto there is a section in it where he describes the nature of the 360 cycle and all the phases and aspects that take place within it from an evolutionary point of view. What conclusion are you referring to in your relatives chart Ari ? Well, heck, it really depends on how we wish to use and apply the word 'karma'. For me Karma is simply the natural law of each cause having an effect, every desire correlating to an action taken that creates an equal or proportionate reaction: cause and effect. Throw a pebble in the pond and it creates ripples. Skipped steps do not happen by themselves. There is a Soul making choices that have effects to those choices. Thus, from this point of view the effects of the choices equaling skipped steps could be seen as the karmic consequence to those choices. From my point of view karma just is. How we 'judge' karma as is 'good' or 'bad' karma is of course a subjective issue. Well yes, by your definition then one could say that an avatar who has evolutionary intent also has Karma right? Like Yogahanda who had the evolutionary intent to understand that there is evil in the world could also be his Karma...using Karma in a big way not- good/bad way correct? I guess I have never seen the skipped steps as "karma", just as things we forgot or did not get right... but one could use karma in that very benign way too.... The word Karma had such baggage, i like to know what people think!!!! 1. There is no karma for an avatar bc they are beyond any binding to causality? meaning the rules of cause and effect no longer apply. Like throwing a pebble in water- it may turn into a lotus flower. 2. so my understand is, an avatar can have any chart. we just have to understand WHY they have that chart. in the case of my relative, what kind of observations would lead to the conclusion that she was an avatar? Well this is why I mentioned that all of us need to be very , very careful is our use of the word karma and what it actually is or means. Relative to Yogananda and his 'lesson' of learning about 'evil the only way I would use the word karma is if indeed he has made a prior life CHOICE , a willful choice, to not believe in or grasp the reality of evil. If that was the case then I would certainly use the word karma for what he then had to go through and endure in his life as Yogananda as it relates to evil be forcefully in his life in a variety of circumstances. On the other hand, if he had not made the prior life choice then I would understand his encounters with evil as a necessary ongoing evolutionary process, intention, for his Soul to continue to evolve. This is just how I try to approach this issue in order to affect some kind of discrimination is the use and application of the work karma , and the natural laws behind it. When I shared earlier about Avatar's not having 'karma' I should have been more specific in that what they do have no EARTHLY karma. Most still do have karma from the point of view of the Astral and Causal realms. Who made that conclusion ? Nothing that I shared before made such a conclusion. I was simply talking about the nature of skipped steps in her case and compensating for her natural nature. As you wrote, in the case of an avatar there is no karma (earthly at least) no matter what symbols we see in their chart. So my question is purely theoretical: IF she was an avatar, what kind of observations would indicate that? point of clarification: squares to the nodes indicate choices that have lead to the conditions of what we call a skipped step. If in a past life there were no choices to necessitate such a condition, it is still possible, in a current life, to have planets squaring the nodes. Can you explain to me WHY an avatar would choose that? Thank you for spending time on this Rad. I really appreciate it.